The Top End of northern Australia is the second northernmost point on the continent. It covers a rather vaguely-defined area of around 400,000 square kilometres behind the northern coast from the Northern Territory capital of Darwin across to Arnhem Land with the Indian Ocean on the west, the Arafura Sea to the north, and the Gulf of Carpentaria to the east, and with the almost waterless semi-arid interior of Australia to the south, beyond the huge Kakadu National Park. The Mary River coastal floodplain is located 90km east of Darwin. It extends from the junction of the Mary and McKinlay Rivers near the Arnhem Highway in the south, to Point Stuart in the east (including Swim Creek Plain), and Lake Finniss and the Adelaide River floodplain in the west. The site encompasses an area of 1674 km² and is predominantly seasonally inundated freshwater floodplain (1005 km²). During the dry season (May – September) the weather in the Top End is near perfect – 27-32 degrees celsius, with very little or no rain. The build up or troppo season (October) and build down (April) are characterised by high humidity and low rainfall. Once the wet season begins in the Top End (November – March), it’s more difficult to get to places. The monsoonal rains make rivers impassable and some areas inaccessible by road. The wild electric storms turn the sky into a spectacular light show and the rain dramatically transforms the landscape. The Top End of the Northern Territory is known for its tropical weather, rich aboriginal culture, national parks and laid-back lifestyle. It is home to an eclectic mix of cultures whose outdoor lifestyle is complemented by brilliant sunsets, fantastic fishing and a colourful calendar of outdoor events. Northern Australia is a vast region stretching from the Kimberley Plateau of Western Australia through the Top End of the Northern Territory to the tip of Queensland's Cape York. 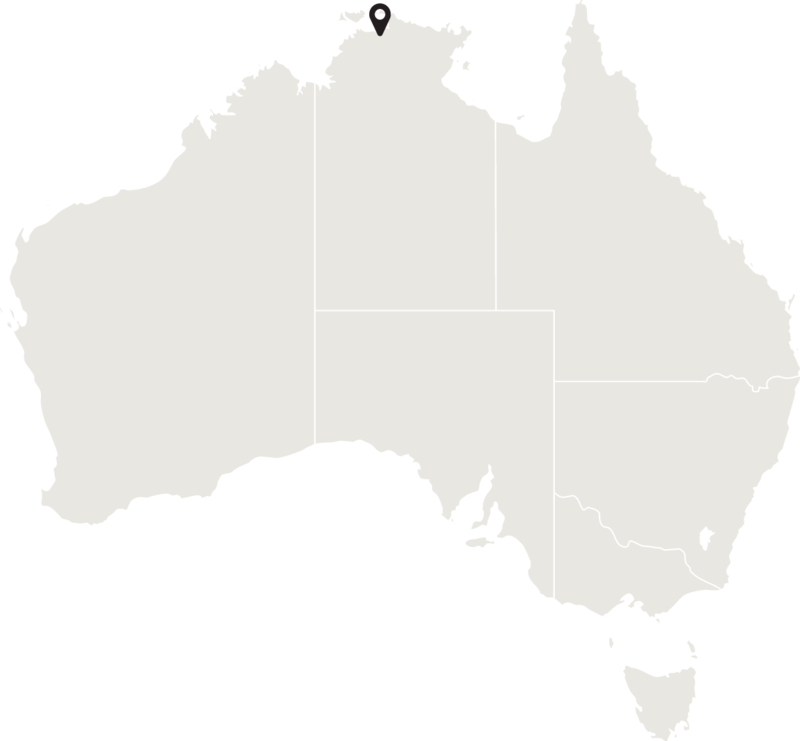 In Northern Australia five percent of the population inhabit approximately half of the continent. The Top End has been constantly occupied for more than 60 000 years. This is reflected by one of the oldest currently practiced cultures in the world, which has been passed down through countless generations. The Top End includes spectacular wetlands and waterfalls, awe inspiring rocky outcrops and Precambrian escarpments up to 1.6 billion years old. 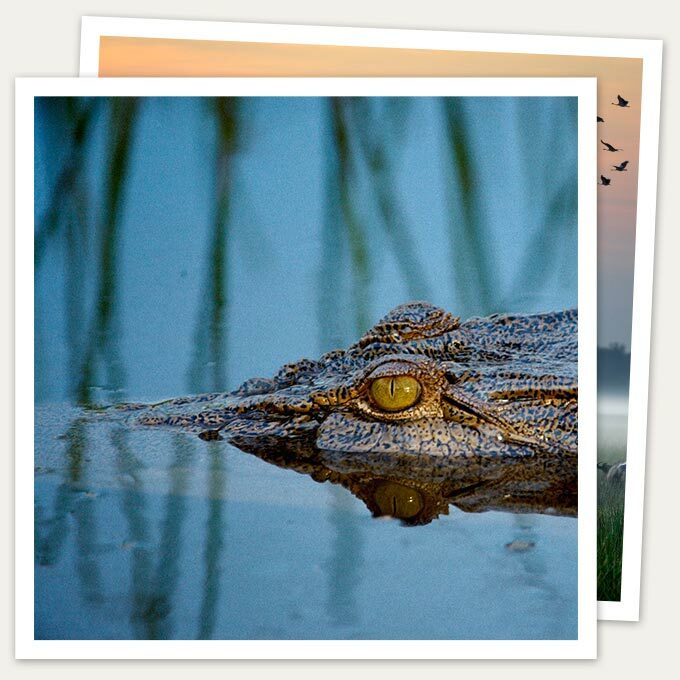 The abundant wildlife includes freshwater and saltwater crocodiles and a wealth of rock-art that is amongst the oldest on earth. The landscape is relatively flat with river floodplains and grasslands with eucalyptus trees along with rocky areas and patches of rainforest, and in western Arnhem Land a high rugged sandstone plateau cut through with gorges, much of which is in Kakudu National Park. The rivers that form the wetlands include the South and East Alligator Rivers, Mary River, and the Glyde River. The climate is tropical monsoon with a wet and dry season. Temperatures do not fluctuate widely throughout the year. The Mary River floodplain inflow channel diffuses into vast seasonal swamps before reaching the sea through a number of tidal channels. Compared to other coastal floodplains in the Northern Territory, this feature results in greater areas of wetland habitats flooded over extended periods and an extremely complex and productive system. 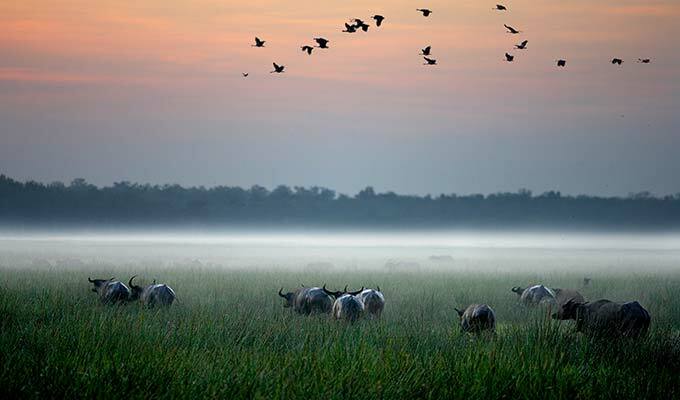 The floodplain is dominated by a mix of sedge and grass communities and large paperbark forests in the north, and fringed by open eucalypt woodland and pockets of monsoon forest. Flora - Most savanna in Australia is used for grazing livestock but in this far north there are vast areas of grassland in their original state and dotted with Darwin stringybark and Darwin woollybutt eucalyptus trees. Fauna - The floodplain comprises a complex mosaic of wet and dry habitats which support vast populations of waterbirds and unique wildlife. The rivers and estuaries are home to large populations of both Saltwater Crocodile and Freshwater Crocodile, as well as Bull Sharks, Sawfish, and Dugong. The wetlands are a rich habitat vital to bird migration and home to large populations of birds including the world's largest breeding colony of Magpie goose (numbers exceed 400,000 during breeding season in some years), as well as large numbers of rodents and snakes. The floodplain environments also provide a major breeding area for many fish species, notably Barramundi. Endemic species of the Top End include Woodward's Wallaroo, Oenpelli python, Chestnut-quilled Rock-Pigeon, Arnhem Land Rock Rat, and several species of skink. Other reptiles include Frill-necked Lizards and large monitor lizards (known locally as Goannas.) Snakes include the Olive Python, Death Adder, Mulga, Water Python (Liasis fuscus), and various others. The plateau is home to many of these endemics especially invertebrates, fish, and frogs, including for example hundreds of species of ant.